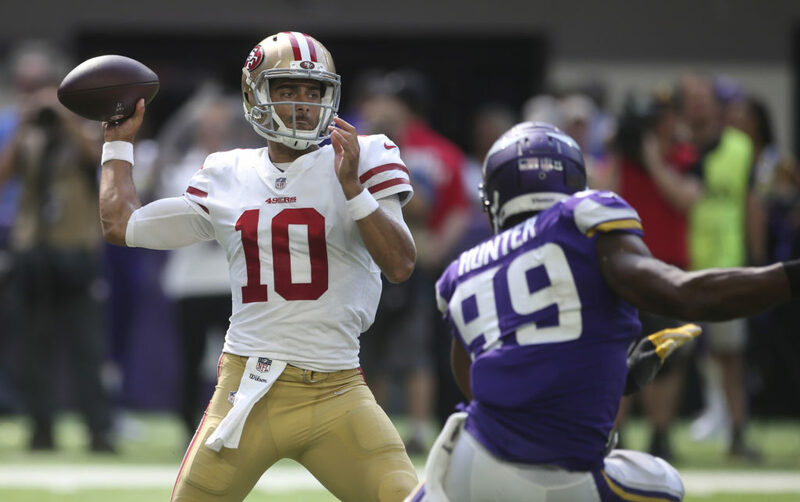 Check out my postgame report of the 49ers 24-16 loss to the Minnesota Vikings. First off Joshua Garnett is a paper player. No one touches this guy and he goes down! Same old with him. Garcon was another goat of the game. I hope this game ends the love affair that some posters had with Morris. He had a productive game against the Colts but it was due more to the O-line than his own effort. Breida actually ran harder in the second half. Now the team is lucky that they did sign Morris because of the injuries that hit, but the delusion that he was going to be the featured back was just absurd. This scheme is just not geared to opening holes for an up the middle power runner. This pretty much negates the advantage of having one. Unless you have Lynch or a similar monster back they will not push their way through a stacked defense on those goal and short plays. Especially when they know it is coming. They should not have run up the middle period. Really bad play calling. As was stated- when a player almost loses the ball you do not give it to them again. totally agree,,,silly call by Kyle who is, it becomes clear, a mixed bag. Yes, they had a chance to win but they dropped THREE TD’s. JG was under intense pressure all game by a good DL and edge rushers. he was hit 9 times and sacked 4 times. Our OL is a joke. Lynch is becoming suspect as a judge of FA talent as well as some draft talent. JG has got to start passing to the sidelines. 85% of his passes are over the middle. MN was loading up on those passes while pressuring JG endlessly. Love all the upgrades to this blog, Grant! This pretty much mirrored what I saw watching the game except you added detail and reasons for those cover mistakes. Would add that what made it more obvious that the Niners messed up the opportunity to win was that the Vikes did not play that well in the second half- especially their offense. Thats what gave the Niners those multiple opportunities to pull out the game. Even with those opportunities they messed up by those bad decisions. Sure the defense played well in the second half but the Vikes began to make bad plays as well. Cousins was not as accurate with his passes as he was in the first half. Morris – Why run directly at a pile of players when there is one player to beat in the flat and an open end zone behind him? Thomas – Come on man. The 49ers Defense is really good, imagine if they had Mack. Hopefully this game is the wake up this team needs, they have the talent. I take the hit, the team will not go undefeated. HEY …! Can you guys believe it…? Our old ‘Game Manager’ Alex Smith managed another team to a win yesterday for the Washington Redskins…Too bad Jim (coach) Harbaugh couldn’t find the magic button to make him work when HE WAS HERE…HUH…? Go ahead, blame Trent Baalke for trading him away, that only magnifies that Harbaugh wasn’t and shouldn’t have been in charge of adults playing football….Just who the hell hired that guy anyway…? GO ALEX…!!! You’re the last bona fide QB the 49ers have drafted….